Following a whirlwind tour of eastern China by Mars Society President Dr. Robert Zubrin and his wife, science educator Hope Zubrin, the Mars Society China has taken off. During the course of the week-long visit in late March, organized by Mars Society China Executive Director Angela Tingting Cui and her capable team, Dr. Zubrin gave a series of talks at Shanghai JiaoTong University and Beijing BeiHang University, “Case for Mars” book clubs in Jinan and Beijing and a Chinese space agency institute in Beijing. 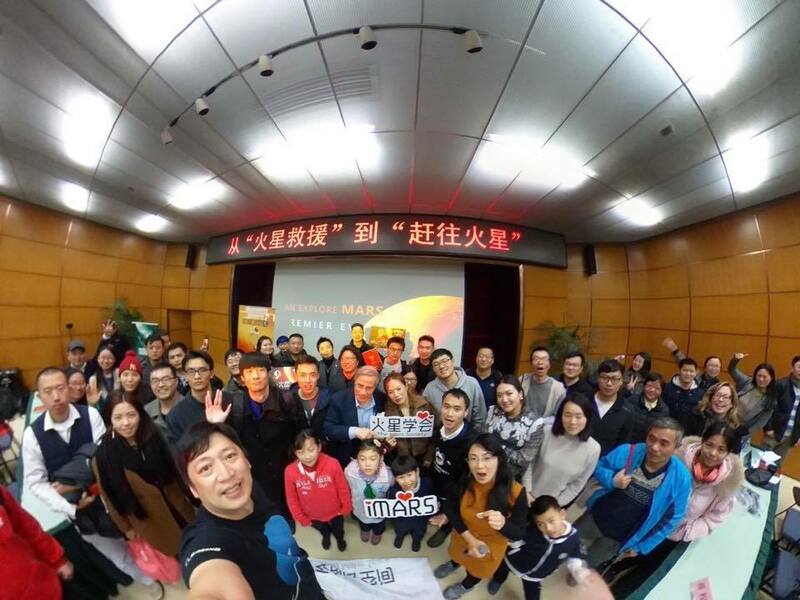 The final speaking engagement was the founding event of Mars Society China at the Beijing Planetarium on March 30th. The Zubrins and Ms. Cui also met and had fruitful discussions with creative and educational teams developing the new Shanghai Planetarium, the Chinese Aerospace Science and Technology Corporation, the leader of the Chinese Mars desert research station program, and Chinese STEM educators, all of whom invited the Mars Society to collaborate on their projects. A photo journal of the tour published by the Mars Society China can be viewed by clicking here. 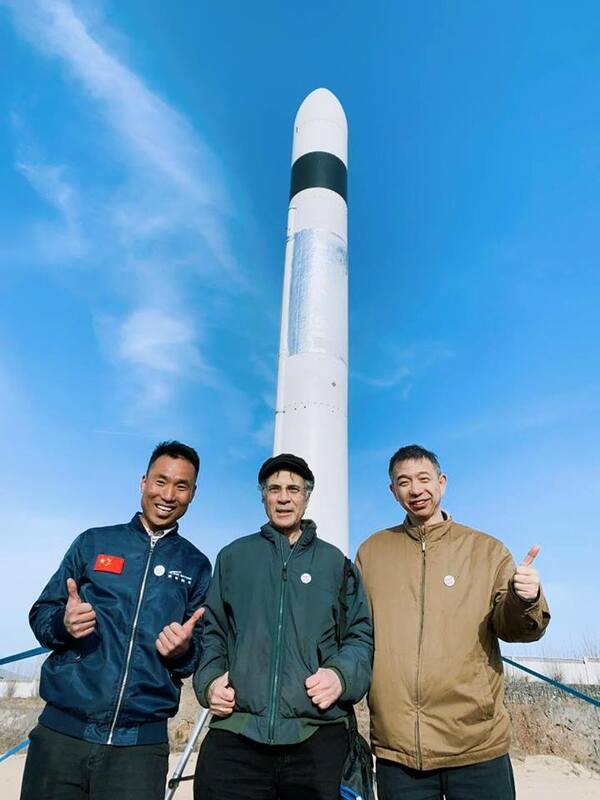 A highlight of the trip occurred when the Zubrins and Ms. Cui were invited to witness the first un-tethered launch of a test vehicle for the planned reusable micro-satellite launcher being developed by the entrepreneurial Chinese rocket company Linkspace. In this extraordinary event, which occurred in a small sea-side town in China’s Shandong province, the young Linkspace team, led by its 26-year-old CEO Spencer Hu Zhenyu, launched its 3000 lbf thrust rocket in 20 knot winds to an altitude of about 100 feet, hovered there - virtually motionless despite the strong winds - for 30 seconds and then brought it down to land softly less than 20 inches (!!!) from the center of the launch pad from which it had taken off. The team will soon continue its reusable system flight tests to much higher altitudes, and is developing a 20,000 lbf thrust methane/oxygen engine which it will use to deliver small satellites to orbit starting about two years from now. Observing the launch, Dr. Zubrin called it “a tour de force, like watching the child Mozart composing a symphony.” As the CTO of a multi-billion dollar Chinese corporation was also present to observe the launch, there is little doubt that Linkspace will secure the investment it needs to scale up. According to Spencer Hu, the team was inspired to undertake its efforts by SpaceX’s success and the vision of human Mars exploration set forth in Dr. Zubrin’s The Case for Mars. Some five other Chinese entrepreneurial launch companies are now actively developing private launch systems as well. Dr. Zubrin’s public talks were attended by hundreds of people, with tens of thousands more watching online. He was also interviewed by several Chinese press outlets, including the influential Global Times newspaper. Among the most exciting opportunities that occurred during the trip to China was an invitation by the creative team of the new Shanghai Planetarium - which will be by far the largest planetarium in the world upon completion in 2020 - to have the Mars Society collaborate in helping to propose and design exhibits. The Mars Society was also invited to send a team to the new Chinese Mars desert station – which is already operating as a STEM project – to provide advice to help enable analog research programs there as well. For their part, the Chinese vowed to send a team to witness the Mars Society’s University Rover Challenge that will take place at the Mars Desert Research Station in Utah May 30 - June 1, with a goal of enlisting several Chinese university teams to participate in the competition next year and possibly organize national high school level rover competitions at the Shanghai Planetarium as well. For more information about the Mars Society and its mission, please visit: www.marssociety.org.